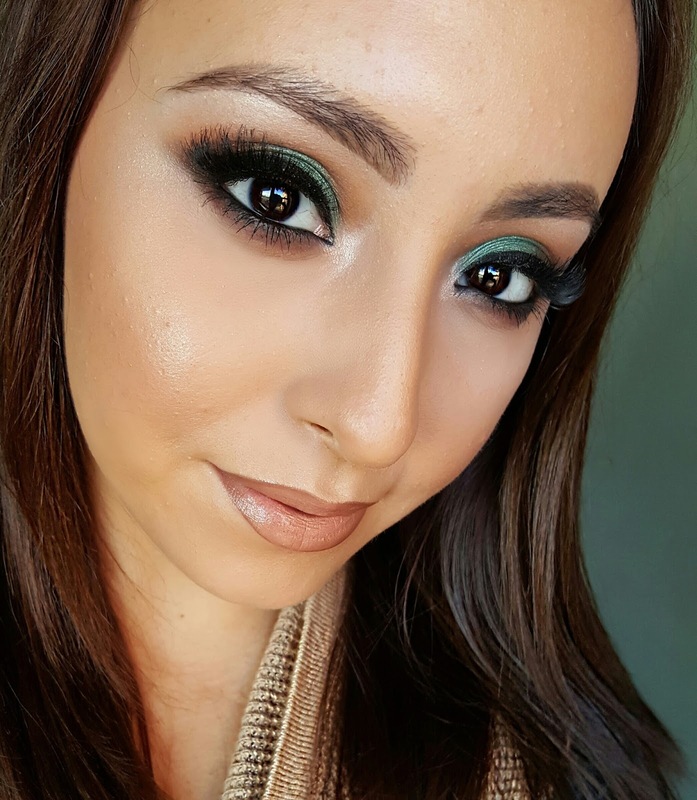 Social media has a way of influencing the beauty industry's latest trends and Too Faced is no newb to this phenomenon (take their Selfie Powders for instance). 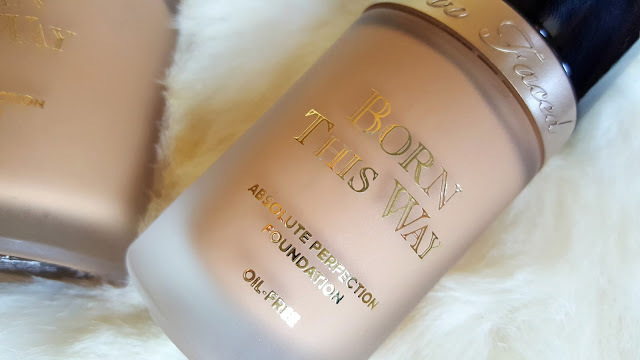 Their latest addition to the line is the Born This Way Foundation, a base makeup that claims to blur the line between makeup and skin, making it virtually undetectable as if you were "born this way". Was anybody else reminded of the Lady Gaga song or the Maybelline catchphrase when they heard this name? No? Just me? Okay. 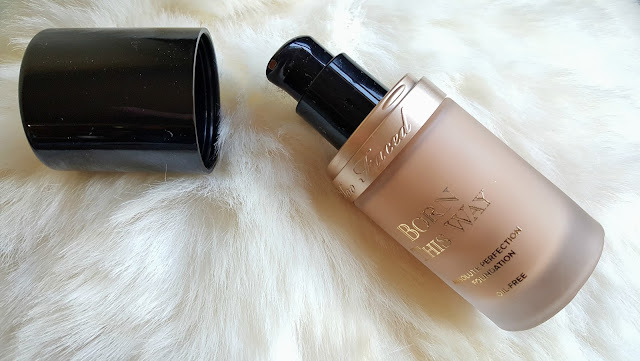 Back to the matter at hand...When this foundation first launched, it seemed as though every popular beauty blogger on social media received a set of them, flooding our feeds at all times for at least a month. Needless to say, I'm very weary of overly hyped products. I like to see them in action and without a relatable, acne-prone blogger testing it out, there was no reliable source for me to put much stock in this product. With that being said, I got the idea in my head that I would make the perfect guinea pig for all the acne-prone beauty addicts out there. So, of course, I went out and purchased the foundation myself. On first impressions, the packaging is absolutely glorious. For a brand that straddles between the mid- and high end price range, they made sure you got a little taste of luxury. The packaging features gold lettering and accents contrasting against the bold, shiny black cap that securely snaps shut (amen! ), a frosted glass finish, and, most importantly, it has a pump! How many times have your favorite foundations decided to cut corners on providing a pump and caused you to tip out entirely too much product? Far too many, I know. Well, that won't be the case here. In fact, I find the pump to give out just enough to provide a thin layer over the entire face. The only down side to this packaging that I can find would lie in the fact that the glass is frosted. While it gives a nod to the foundation packaging of more luxurious brands, it obscures the the actual shade of the foundation inside, making them appear a bit lighter than they actually are. 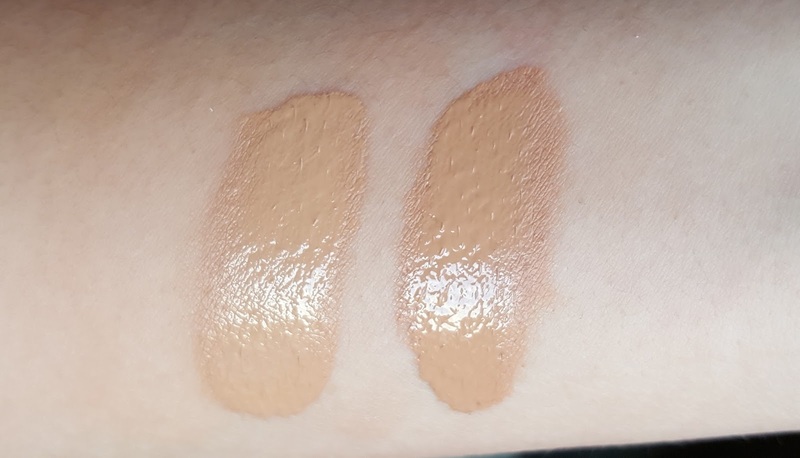 So swatching in-store might be an important factor when finding your shade with this one. Currently, I have two of the Born This Way Foundations in my collection as I got a bit darker over the summer. Warm Beige is a light-medium shade with yellow undertones, perfect for when I'm at my lightest. Golden is a medium shade with strong peach undertones, but is very flattering when I'm beginning to get tan. Since I'm fairly light right now, I used the Warm Beige shade for this demo and I have to say I really like this foundation. I have used it over the course of a few months and find that it gives me a very natural satin finish, meaning there is a bit of a glow, but it's nothing over-the-top. 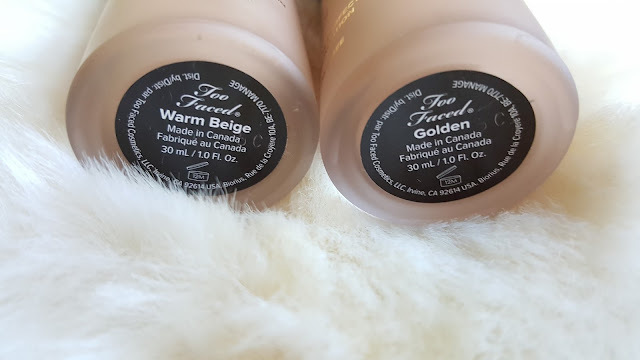 This foundation applies well with both a foundation brush and a beauty blender. In fact, I like to use both at times. What I tend to do is apply one small pump over my entire face with a beauty blender. This corrects the redness and discoloration that I have in my skin. Then, with a flat top foundation brush, I stipple on a very small amount over my hyper pigmentation, like old acne scars or current acne. 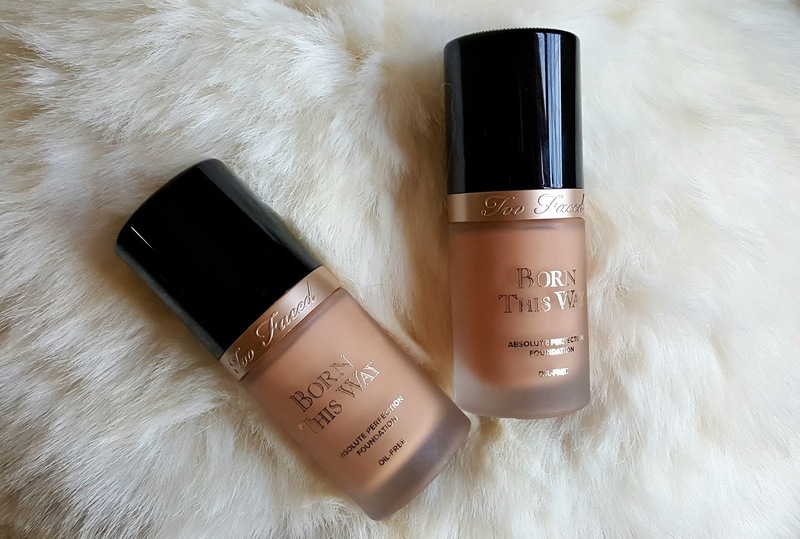 This foundation starts off as a medium coverage and it can be built up to full coverage for sure. My favorite aspect of this particular formula is how blendable it is; it almost seems to blend into and adjust to my skin. However, I will argue with Too Faced about it mimicking the look of natural skin. While it by no means looks cakey, it does in fact look like foundation--a very nicely applied foundation, but still a foundation nonetheless. I don't think there is really a way around looking like you have makeup on your face when you're covering acne. And since we're on the topic of acne, I know those of you with sensitive acne-prone skin will want to know if it'll break you out. Unfortunately, it can. BUT, and this is a huge but, there are ways to prevent it. I find that my skin tends to break out when there is too much moisture added to it. With the moisturizer that I already applied to my face and the oils that my skin naturally produces, the added moisture provided by this foundation can really be suffocating, thus, clogging my pores. So to counteract that bit, I make sure to use a mattifying primer. Not only does this extend the longevity of this foundation for me, but I'm less likely to break out. 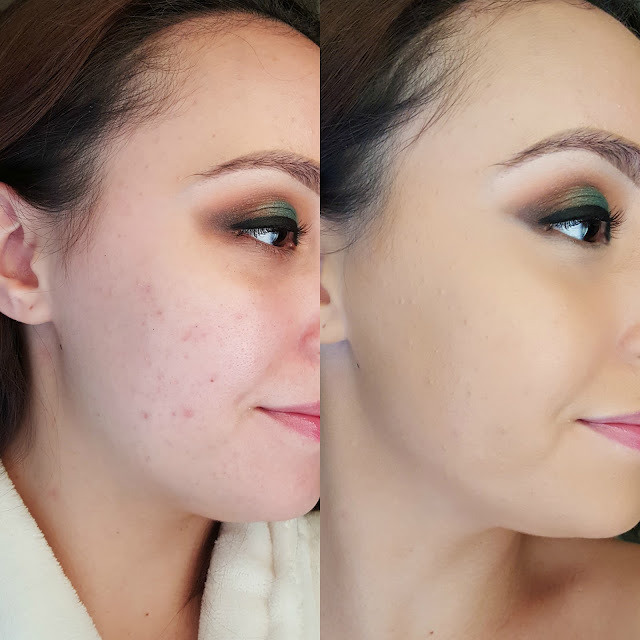 Just a little tip if you're looking to make this gorgeous foundation work for you.